At JMP Services Ltd we can manage all types of asbestos removal, including licensed asbestos removal through our network of tried and trusted licensed associates. We specialise in the safe removal of asbestos containing materials (ACMs), this is our particular area of expertise. Operating in all market sectors we have experience across a wide range of environments, from asbestos removal in people’s homes and garages to industrial units and commercial premises, even removing asbestos from church organs! We take pride in the relationships we develop with all the customers who require our specialist asbestos removal services - whether they are in the commercial or industrial sector, domestic homeowners or contractors working for the public sector or residential social landlords. The service JMP offer forms one part of the asbestos management jigsaw. We have cultivated relationships with a range of experts from asbestos sampling, identification and survey specialists to air testing consultants; working together we can provide you with a platform for compliance with the Control of Asbestos Regulations 2006. An accessible, flexible and responsive service, starting with the way your initial enquiry is handled through to the completion of the project. A commitment to creating a safe working environment, operating to best practice and in line with the Control of Asbestos Regulations 2006. Minimum disruption to your place of work, home or any other location where asbestos removal is taking place and an assurance that the site will be left completely safe and free from asbestos hazard. A service that provides value for money. Following the correct procedures for asbestos removal, as outlined by the Control of Asbestos Regulations 2006, means that “cutting corners” to reduce costs is not an option. A team of experienced operators who have the training to understand the consequences of the material they are dealing with and the maturity to treat you and your property with “old fashioned” courtesy and respect. Our desire to create long term relationships with customers, a stability that has a positive impact on the management of asbestos materials within your property portfolio. 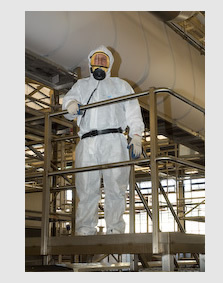 The use of well maintained quality equipment to carry out the asbestos removal. Peace of mind that the company you have chosen employ the most environmentally friendly working practices available in all the assignments they undertake.